I like a tidy house and if something is misplaced . . .
well, it gets put "somewhere". The somewhere either a closet a drawer or the corner cabinet! Which is one way tea used to be sold eons ago! The real test is with the door closed. I think it passes muster! The bottom of the stairs. 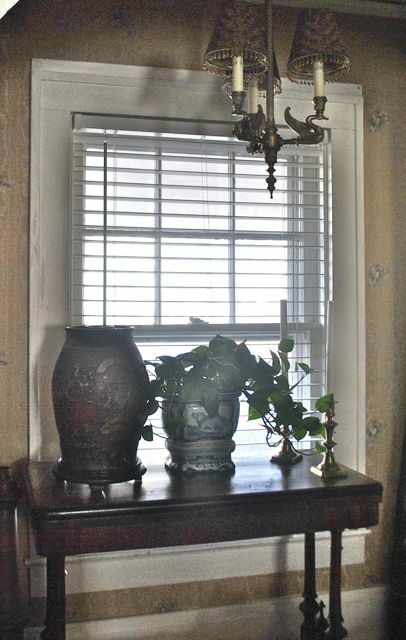 I hate to have a good window without a plant -- seems to me to be a waste of light! You all may remember that my planter was a $5 Estate Sale find. And it was unusual -- I'd never seen anything like it before. What did I find . . . It seems I made a "score" -- it was circa 1900! With some thought . . .
and played with the "big boys" downstairs! The red pottery next to the blue and white cachepot is an English Royal Doulton gin jar -- 1800s which was a gift several years ago to Husband Jim who fell in love with it at an Antique Show that we went to in the city. 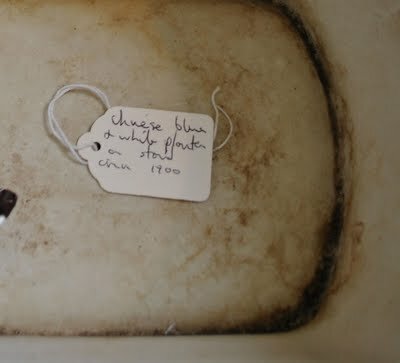 And in all of our antiquing in England, we didn't see many of them so perhaps they are rare. "because company is coming over"! are neat and tidy once again! Oh, and the back of the tank is now empty . . .
wHAt a find.... 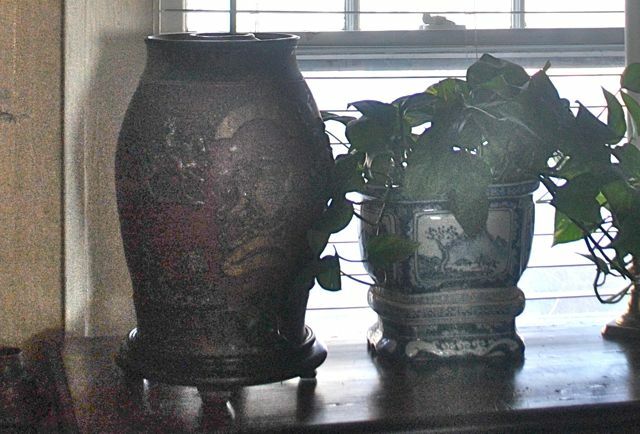 I love blue and white planters as well... Ive been looking for just the right one.... but I mUSt say $5 sounds much BEtter than $800!whew!!! Everything looks wonderful and just sparkles! 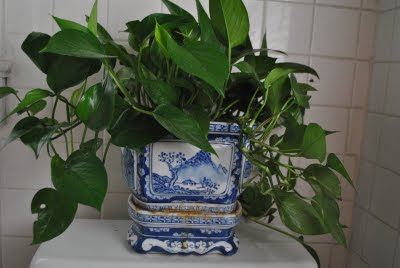 Martha, your blue and white planter is just gorgeous and wow did you have an excellent "find". I am assuming that you passed on the twin? A clean house that is getting a deep clean does feel so very good, you are an inspiration. Wonderful! 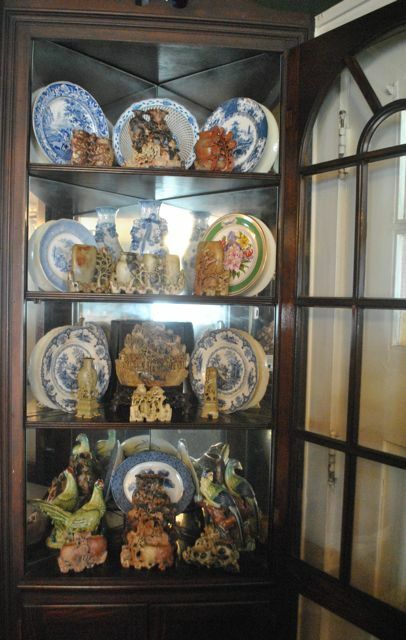 I love your china cabinet. So pretty. And knew you had a goody when I spied the planter. What a great find! It's definitely good to have a clear-out every now and then. I've been clearing out cupboards because three special things I like to use at Christmas had all disappeared under the dreck. After a week of sorting and rearranging and taking stuff to Goodwill, they've all turned up. One in particular was a real relief -- a small ginger jar with an English robin on it which was a gift from my beloved sister-in-law in England. Whew! I was afraid it had been lost forever. This is the first house we've had with no bathroom window, in the main and ensuite. I'd love to have a plant on the back of the toilet. 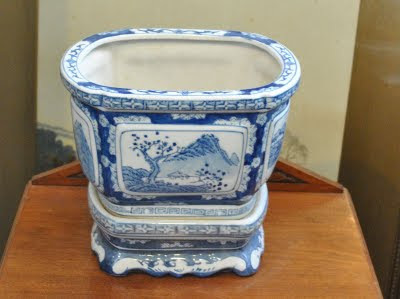 The new place by the window for your blue and white cachepot will have it noticed more perhaps. I love to have things organised and tidy after Christmas - it gives me such a feeling of 'fresh start'. 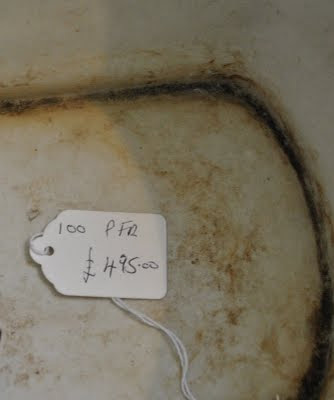 That little pot was certainly a wonderful find - you struck gold! 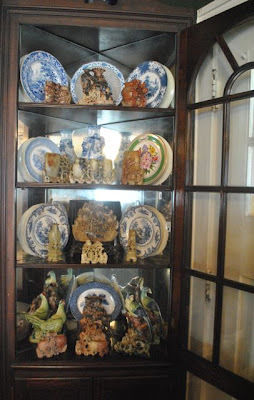 I love your choice of treasures in the cabinet!!! All too well, I understand the true test of when the doors are closed!!! I did a re~arrange and de~cluter On Crooked Creek yesterday, which took longer than planned because each time I closed the cabinet door, I had to move decor items to the right or to the left!!! What a great Estate $ale find!!! I agree, it looks lovely on the stairs!